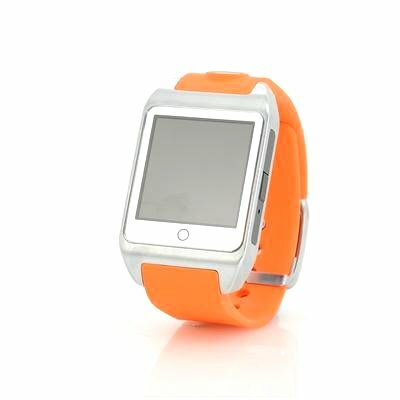 Successfully Added inWatch Z Watch Phone - 1.63 Inch Transflective Sapphire Screen, Android 4.2, IP57, Bone Conduction Speaker (Orange) to your Shopping Cart. InWatch Z is now available in this sporting orange which offers a new look to the Android watch phone. It benefits from a high grade silicon strap and aluminum frame showing of its beautifully crafted design that lends it strength while remaining light weight. The sapphire crystal face and IP57 rating give testament to its tough and durable credentials that allow it to resist dust, water and scratches. The outer beauty of this phone is match only by its internal workings as it has a MTK6572 dual core CPU, 1 GB or RAM and 8GB or internal memory proving the beauty is more than skin deep. Don't worry about being weighed down you can slot in a micro SIM card and leave your phone at home. The 1.63 Inch Transflective Sapphire Screen is the same as you will find on the iphone and with a 240x240 resolution you can enjoy snapping pictures or taking video with the 5 megapixel camera. The screen luminescence is automatically adjusted based on the ambient lighting so the semi transparent TFT screen is always easy to view even in full sunlight. Bone conduction technology is also included making it easy to talk on this watch phone when out and about or even listen to tunes without drowning out the world around you. With Android 4.2 there are counltess apps to download and install so you can download a map to track your runs or use the built in GPS functions to navigate in a new city, the possibilities are endless. Google Play Store is not available on this poroduct.